There is a rapidly increasing amount of de novo genome assembly using next-generation sequencing (NGS) short reads; however, several big challenges remain to be overcome in order for this to be efficient and accurate. SOAPdenovo has been successfully applied to assemble many published genomes, but it still needs improvement in continuity, accuracy and coverage, especially in repeat regions. To overcome these challenges, we have developed its successor, SOAPdenovo2, which has the advantage of a new algorithm design that reduces memory consumption in graph construction, resolves more repeat regions in contig assembly, increases coverage and length in scaffold construction, improves gap closing, and optimizes for large genome. Benchmark using the Assemblathon1 and GAGE datasets showed that SOAPdenovo2 greatly surpasses its predecessor SOAPdenovo and is competitive to other assemblers on both assembly length and accuracy. We also provide an updated assembly version of the 2008 Asian (YH) genome using SOAPdenovo2. Here, the contig and scaffold N50 of the YH genome were ~20.9 kbp and ~22 Mbp, respectively, which is 3-fold and 50-fold longer than the first published version. The genome coverage increased from 81.16% to 93.91%, and memory consumption was ~2/3 lower during the point of largest memory consumption. The increased use of next generation sequencing (NGS) has resulted in an increased growth of the number of de novo genome assemblies being carried out using short reads. Although there are several de novo assemblers available, there remains room for improvement as shown in recent assembly evaluation projects such as Assemblathon 1 and GAGE. Since the publication of the first version of SOAPdenovo, it has been used to assemble many large eukaryotic genomes, but reports have indicated areas that would benefit from updates, including assembly coverage and length[4, 5]. SOAPdenovo2, as with SOAPdenovo, is made up of six modules that handle read error correction, de Bruijn graph (DBG) construction, contig assembly, paired-end (PE) reads mapping, scaffold construction, and gap closure. The major improvements we have made for in SOAPdenovo2 are: 1) enhancing the error correction algorithm, 2) providing a reduction in memory consumption in DBG constructions, 3) resolving longer repeat regions in contig assembly, 4) increasing assembly length and coverage in scaffolding and 5) improving gap closure. Our data show that SOAPdenovo2 outperforms its predecessor on the majority of the metrics benchmarked in the Assemblathon 1 as well as GAGE; and in addition, was able to substantially improve the original assembly of the Asian (YH) genome that was done using SOAPdenovo. Dealing with sequencing error in NGS data is inevitable, especially for genome assembly applications, the outcome of which could be largely affected by even a small amount of sequencing error. Hence it is mandatory to detect and revise these sequencing errors in reads before assembly[2, 7]. However, the error correction module in SOAPdenovo was designed for short Illumina reads (35-50 bp), which consumes an excessive amount of computational time and memory on longer reads, for example, over 150 GB memory running for two days using 40-fold 100 bp paired-end Illumina HiSeq 2000 reads. Thus, by a skillful exploitation of data indexing strategies, we redeveloped the module, which supports memory efficient long-k-mer error correction and uses a new space k-mer scheme to improve the accuracy and sensitivity (see Additional file1: Supplementary Method 1 and Figures S1-S3). Simulation test shows that the new version runs efficiently and corrects more reads authentically (see Additional file1: Tables S1 and S2). In DBG-based large-genome assembly, the graph construction step consumes the largest amount of memory. To reduce this in SOAPdenovo2, we implemented a sparse de Bruijn graph method (see Additional file1: Supplementary Method 2), where reads are cut into k-mers and a large number of the linear unique k-mers are combined as a group instead of being stored independently. Another important factor in the success of DBG-based assembly is k-mer size selection. Using a large k-mer has the advantage of resolving more repeat regions; whereas, use of small k-mers is advantageous for assembling low coverage depth and removing sequencing errors. To fully utilize both these advantages, we introduced a multiple k-mer strategy in SOAPdenovo2 (see Additional file1: Supplementary Method 3 and Figure S4). First, we removed sequencing errors using small k-mers for graph building, and then we rebuilt the graph using larger k-mers iteratively by mapping the reads back to the previous DBG to resolve longer repeats. Scaffold construction is another area that needs improvement in NGS de novo assembly programs. In the original SOAPdenovo, scaffolds were built by utilizing PE reads starting with short insert sizes (~200 bp) followed iteratively to large insert sizes (~10 kbp). Although this iterative method greatly decreased the complexity of scaffolding and enabled the assembly of larger genomes, there remained many issues that resulted in lower scaffold quality and shorter length. For example, 1) the heterozygous contigs were improperly handled; 2) chimeric scaffolds erroneously built with the smaller insert size PE reads which then hindered the later steps to increase of scaffold length when adding PE reads with larger insert size; and 3) false relationships between contigs without sufficient PE information support were created occasionally. To improve this in SOAPdenovo2, the main changes during the scaffolding stage were as follows: 1) we detected heterozygous contig pairs using contig depth and local contig relationships. Under these conditions, only the contig with higher depth in the heterozygous pairs was kept in scaffold, which reduced the influence of heterozygosity on the scaffolds length; 2) chimeric scaffolds that were built using a smaller insert size library were rectified using information from a larger insert size library, and 3) we developed a topology-based method to reestablish relationships between contigs that had insufficient PE information support (see Additional file1: Supplementary Method 4 and Figures S5-S7). Short reads enabled us to reconstruct large vertebrate and plant genomes, but the assembly of repetitive sequences longer than the read length still remain to be tackled. In scaffold construction, contigs with certain distance relationship, but without genotypes amid were connected with wildcards. The GapCloser module was designed to replace these wildcards using the context and PE reads information. In SOAPdenovo2, we have improved the original SOAPdenovo GapCloser module, which assembled sequences iteratively in the gaps to fill large gaps. At each iterative cycle, the previous release of GapCloser considered only the reads that could be aligned in current cycle. This method could potentially make for an incorrect selection at inconsistent locations with insufficient information for distinguishment due to the high similarity between repetitive sequences. For SOAPdenovo2, we developed a new method that considered all reads aligned during previous cycles, which allowed for better resolution of these conflicting bases, and thus improved the accuracy of gap closure. (see Additional file1: Supplementary Method 5). To test the performance of SOAPdenovo2, we assembled the Assemblathon1 benchmark dataset and evaluated the assembly using the Assemblathon1’s official evaluation pipeline. Our analyses showed that SOAPdenovo2 performed better than the initial release of SOAPdenovo (hereafter referred to as ‘SOAPdenovo1’) and SOAPdenovo v1.05 (hereafter referred to as ‘SOAPdenovo1.05’) used in Assemblathon1. Notably, SOAPdenovo1.05 was developed two years after SOAPdenovo1 for the Assemblathon1 and has never been formally released. It included partial improvements and new features from SOAPdenovo2, including the new contig and scaffold construction improvements, but without the new error correction and gap closure modules. Compared with the results of SOAPdenovo1, the new scaffold N50 was nearly an order of magnitude longer and the accuracy was higher due to the reduction of structural error by 90.12%, substitution error by 92.13%, and copy number error by 69.47% (Table 1, Figure 1). We also compared our results with that of ALLPATHS-LG, and SOAPdenovo2 produced contig N50 and scaffold N50 that were approximately 1.53 and 1.84-times longer. The SOAPdenovo2 assembly also had a much lower amount of copy number errors, but did have more substitution errors. The lower substitution error in ALLPATHS-LG is likely because it includes a step analogous to “editing the assembly” to eliminate ambiguity, but it does so at the expense of more computational consumption. Improvements of SOAPdenovo2 have also been observed in assembling GAGE dataset (see Additional file1: Supplementary Method 6 and Tables 2 and3). As shown in Tables 2 and3, the correct assembly length of SOAPdenovo2 increased by approximately 3 to 80-fold comparing with that of SOAPdenovo1. Worth mentioning, there are only two levels of insert size for Staphylococcus aureus and Rhodobacter Sphaeroides, the setting of which is optimal for ALLPATHS-LG, but mismatches with the requirement of SOAPdenovo2 to come up with an optimal assembly (see Additional file1: Supplementary Method 4); thus, the results of GAGE might not be able to illustrate the power of SOAPdenovo2, especially for the scaffolding part. Contig and scaffold path NG50 were defined in Assemblathon1. *SOAPdenovo v1.05 and ALLPATHS-LG’s evaluation result data were from. §Time spent on filtering contamination was not included. A comparison of the scaffold N10 to N90 between the assemblies based on the Assemblathon 1 dataset. All datasets were downloaded fromhttp://gage.cbcb.umd.edu/data/. *ALLPATHS-LG was using the latest version 42807. *The published ALLPATHS-LG could not be used to assemble this genome because it requires at least one library with overlapping paired-end reads. We also used SOAPdenovo2 to reassemble and update the previously assembled YH Asian Genome. The previous assembly was done using SOAPdenovo1, but in addition it was also limited by the very short read lengths (~35 bp) that were the standard output of Illumina Genome Analyzers (GAIIx) at that time and by the insert sizes available (maximum size is 10 kb). To provide an updated assembly with the new program, we generated a new set of PE 100 bp-long reads with an insert size ranging from 180 bp to 40 kbp using the Illumina HiSeq 2000 (see Additional file1: Table S3). These new data were put through both the SOAPdenovo1 and SOAPdenovo2 pipelines. To test out the performance of each new feature in SOAPdenovo2, we also assembled the genome with or without the multi k-mers and sparse DBG modules. As shown in Table 4 and Figure 2, using the new data, we found that the Contig N50 and Scaffold N50 of SOAPdenovo2 were, respectively, 1.64 and 3.84-times longer than SOAPdenovo1. The result is also 3-fold and 50-fold longer than the first YH genome version. Notably, by using sparse DBG, the memory consumption for graph construction decreased dramatically, but the N50 contig and N50 scaffold dropped. This is due to the shorter k-mer length required by sparse DBG’s design to acquire higher k-mer depth, which in turn disabled some repetitive sequences from being solved (see Additional file1: Supplementary Method 2). 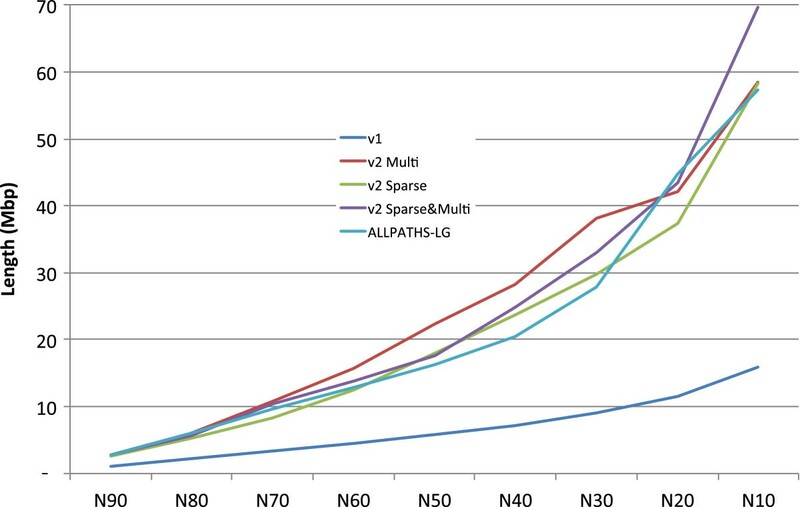 By using larger k-mer length, ALLPATHS-LG outperformed SOAPdenovo2 on contig N50 by 1.49-times, but for scaffold N50, SOAPdenovo2 is 6 Mbp (1.37-times) longer. 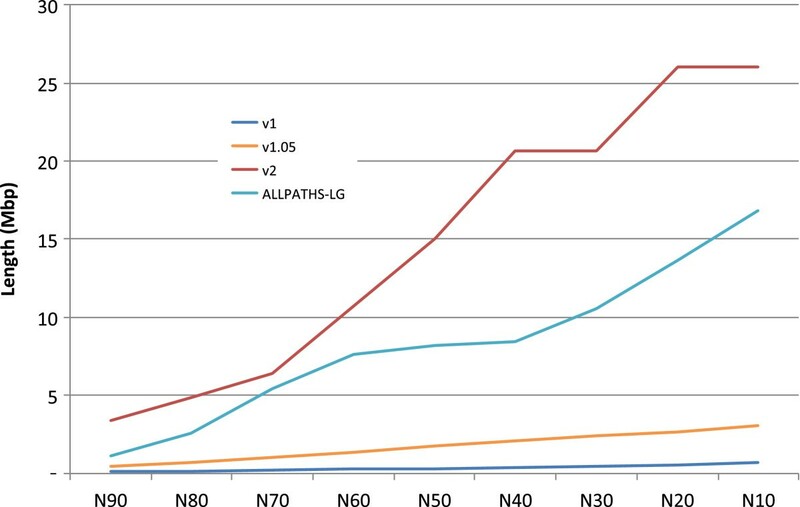 SOAPdenovo2 covered the reference genome 5.38% more and ran 3.36-times faster on the same machine than ALLPATHS-LG. To confirm the contribution of new algorithms, we evaluated both the YH genome assembled by SOAPdenovo1 and SOAPdenovo2 respectively by aligning them to the NCBI human reference genome hg19. We obtained a reference coverage increase from 81.2% to 93.9%, and we found that approximately 95.9% of the newly assembled regions were repetitive sequences. The increased reference coverage is mainly due to the improved SOAPdenovo2, not to the newly sequencing data. To be consistence with the result of ALLPATHS-LG, contigs and scaffolds shorter than 1 kb were filtered for SOAPdenovo assemblies. § Without ‘FixLocal’ due to the module failure (see Additional file1: Supplementary Method 7). ^ Time consumption including SOAPdenovo’s error correction, assembly and gap closure modules. * Time consumption including ALLPATHS-LG’s preparation and assembly modules. A comparison of the scaffold N10 to N90 between the assemblies based on the new YH sequencing data. A previous report had indicated that most of the segmental duplications (SD) were lost in the earlier published version of the YH. To investigate the SD coverage of new version YH genome sequences, we aligned the contigs of the first version and the new version to 134 Mb of published human SD sequences and found that up to 99% of the published SD sequences were now sufficiently represented (≥ 90% of each sequence) in the updated assembly, while only 21.5% were represented in the earlier version (see Additional file1: Table S4). The rate of SD sequences that appeared more than once with sufficient coverage for each copy was increased from 0.02% to 52.6% in the updated version. The assembly of fragmented genes (noted in) was also improved (see Additional file1: Table S5). For example, average coverage of gene GRM5 increased from 90% to 96% and the number of fragments decreased from 162 to 4. The work here demonstrates that SOAPdenovo2 is greatly improved over the initial version and specifically in areas that have been highlighted as problems in the currently available short-read de novo assembly programs. It thus provides an effective solution for carrying out de novo genome assembly especially for eukaryotic genomes. We have also been able to provide a much better quality version of the previously assembled YH genome, which will serve as an excellent reference genome for use in Chinese population studies, as well as for general human genome studies. SOAPdenovo2 has been successfully deployed in public computing clouds including TianHe series supercomputer and Amazon EC2. The raw reads from the YH genome generated in this work are available from the BGI website, the EBI short read archive with study accession [EMBL:ERP001652], and also from the GigaScience database. The updated assembly is also available at GigaScience. In order to facilitate readers to repeat the experiments, the tools and configured packages including commands and necessary utilities are available from our FTP serverftp://public.genomics.org.cn/BGI/SOAPdenovo2, and are also being made available from the GigaScience database. Ruibang Luo, Binghang Liu, Yinlong Xie contributed equally to this work. An erratum to this article is available at http://dx.doi.org/10.1186/s13742-015-0069-2. We would like to thank the users of SOAPdenovo who tested the program, reported bugs, and proposed improvements to make it more powerful and user-friendly. Thanks to TianHe research and development team of National University of Defense Technology to have tested, optimized and deployed the software on TianHe series supercomputers. The project was supported by the State Key Development Program for Basic Research of China-973 Program (2011CB809203); National High Technology Research and Development Program of China-863 program (2012AA02A201); the National Natural Science Foundation of China (90612019); the Shenzhen Key Laboratory of Trans-omics Biotechnologies (CXB201108250096A); and the Shenzhen Municipal Government of China (JC201005260191A and CXB201108250096A). Tak-Wah Lam was partially supported by RGC General Research Fund 10612042. RL, BL, YX and ZL contributed equally to this work. Ju W, Ji W, HY, TL, Yi L and RL managed the project. RL, BL, YX and ZL led the design. RL, WH, JY, GH, YC, QP, YL, JT, GW, HZ, YS, Yo L, CY, DC, SY, XZ, SP, XL and GL implemented and tested the software. BW, Ya L, CH performed sequencing. RL and BL wrote the paper. All authors read and approved the final manuscript.